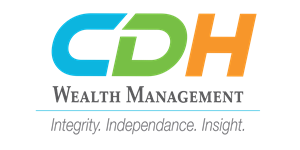 CDH Wealth Management was founded to provide financial planning services and investment guidance for individuals, families and businesses. The firm’s key principles are Integrity, Independence and Insight, factors we bring to each and every relationship. Investors need to know they can trust the guidance they are given and the foundation on which it is based. We believe our independence is crucial in the current environment, as clients rely on receiving guidance and counsel focused on their concerns, not influenced by another agenda or competing interests. Understanding both the client’s unique situation and the current investment and economic environment is essential to our mission. Our firm’s mission is to respectively bring these core principles to our clients and implement a strategy tailored to each client and delivered with unsurpassed service.